On An Overgrown Path: Alchemist of words or universal hippie babbling? Alchemist of words or universal hippie babbling? 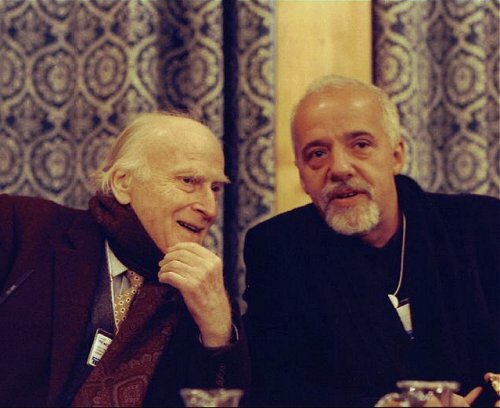 That photo shows Yehudi Menuhin with the Brazilian author Paulo Coelho at the 1999 World Economic Forum in Davos. During my frequent explorations of esoteric paths I am very aware of the danger of what David Hare, with scathing reference to Peter Brook’s style of directing, describes as “a universal hippie babbling which represents nothing but fright of commitment”. For me that universal hippie babbling is epitomised by the books of Paulo Coelho. As Coelho has sold more than 100 million books I must be one of the very few people on this earth with that opinion of his writing, and, believe me, I have tried many times to prove myself wrong. Last year I took The Alchemist to France to see if a different environment would throw a fresh light on that global best seller. But, alas, I found it – again - no more than a trite distillation of perennial wisdom that fails to encourage further exploration of those important traditions outside Coelho’s copious title list. In the continuing search for enlightenment I recently borrowed Fernando Morais’s biography of Coelho - which describes the novelist as “an alchemist of words” - from the library. I should have been warned by its “authorised” imprimatur and publication by the same multi-national corporation as Coelho's novels, so just let’s say that abandonment came before enlightenment. Am I the only one that does not 'get' Paulo Coelho? And strange to see Menuhin getting on famously with the former dabbler in hallucínógens and the occult, because elsewhere the violinist railed against “naked Beatniks of all sexes”. Photo via Wikipedia Commons. Other copyrighted material here is included as "fair use", for the purpose of study, review or critical analysis only, and will be removed at the request of copyright owner(s). Also on Facebook and Twitter. And I am almost certainly the only person on this earth who hasn't read any Harry Potter. But I was invited to have lunch with JK Rowling some years ago when I was involved in the book industry, but couldn't make it as I had another appointment. I guess my invitation to launch with Paulo Coelho is now on hold. Pli, I've had a copy of Coelho's alchemist for 3 years now and I just can't bring myself to take it out of the drawer..I think I'd die of embarrassment if someone saw me actually reading it! And haven't read HP either. ..and the day's mail brings flyers offering courses in Mid-life Crisis, Stress Management, Success Through Assertiveness, Reflexology, Shiatsu, Hypnocybernetics, and The Creative You....mortifying confessions, group therapy, primal screams and "making it"..Maharishi Mahesh Yogi's TM technique for reducing blood pressure and increasing self esteem....books on how to be happy, how to obtain peace of mind, how to win friends and influence people (sold 15 million copies), how to breathe, how to achieve a cheap sentimental humanism at other people's expense, how to become a Chinaman like Lin Yutang and make a lot of money, how to be a Baha'i or breed chickens all sell in the millions. Billoo, there is a reference to another interesting sounding book on the self-help movement in one of the few critiques of Coelho's writing. We get crate loads of this rubbish here: Osho, charlatans like Deepak Chopra, "positive thinking", etc Now, if only Coehlo could tie in his esoteric message with some good ol' fashioned anti-Americanism I'm sure he'd do even better. "Now, if only Coehlo could tie in his esoteric message with some good ol' fashioned anti-Americanism I'm sure he'd do even better." my teenage son on Deepak Chopra and 'life coaches'"Dad what is it with white people with money and bullcrap?" From the Guardian review of Coelho's The Zahir: "Nothing so hurls a writer into stupidity than the desire to be thought wise." The length of the list of writers that may bring to mind is staggering.